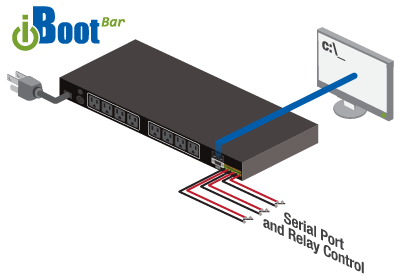 When you need to reduce costly site visits, manage power distribution and increase network reliability, Serial iBootBar puts the power in your hands. Remote power control for reboot, energy management, environmental control or test automation is easy to manage through serial command or GPIO contact closures. With Serial iBootBar, you can remotely detect and respond to physical events like gate openings or spikes in temperature, humidity or pressure – or simply reboot your devices without going onsite. Request a hands on demo with our products here! Serial iBootBar saves you time and money by simplifying power distribution and giving you the ability to monitor and control your devices remotely. Multiple users can control eight independent outlets via RS-232 serial port or contact closures, switching them on or off to reboot, conserve energy, and ensure security. If you already have a remote control, SCADA, RDU or GPIO system, you can add A/C power switching to its monitoring and alarm functions with Serial iBootBar. RS-232 serial control allows you to setup all parameters and control functions through a simple Command Line Interface. Serial iBootBar’s Group and Stagger function enables you to group and manage outlets together, while a programmable Delay Timer prevents units from powering up simultaneously and overwhelming power capacity. Serial iBootBar’s current sensing feature alerts you to critical power conditions so you can take action right away. Even if the network goes down, you can check – from anywhere – if critical devices are still operating, and reboot them if they aren’t. 8 Independently Controllable Outlets Each outlet is named and managed independently. Serial RS-232 Control RS-232 serial control allows for direct control of the sBB outlets, and complete setup of all parameters. Simple Command Line Interface uses clear language commands for all setup and control functions. Contact Closure Control Each outlet is associated with discrete input that can be connected to a physical switch or relay. Changing the state of the input will operate the outlet. Outlets are individually configurable for On and Off state relative to contact closed or open. Multi-User Capabilities Assign permissions to each user for outlets and configuration. Up to 16 users can be assigned administrator or user only rights, plus access to specific outlets and groups. Users only see the outlets and groups to which they are assigned. Current Sensing and Alarms View the total draw for the unit and set alarm points to detect dangerous situations. Outlet Grouping for Simultaneous Management Logically join outlets together to allow redundant powered devices to be controlled with a single command. Or shut down all like devices simultaneously. Delay Timer for Staggered Power-Up Combine any outlets into logical groups and managed together. Power up Delay Timer prevents units from powering up simultaneously and overwhelming the current capacity. Contact Inputs Two Terminals for each outlet control. AWG 30 to 18. Common Ground. User Selectable Contacts Closed are Power On or Off.